ATTENTION SOON TO BE BRIDES! Are you looking for a memorable wedding set up? Rentquest has the perfect decor for your big day! Not to mention, we have our very own bachelorette on our hands here at RQ! The President of this lovely business, Vanessa Cancilla, is tying the knot this September and we couldn't be more excited. With Vanessa's wedding day quickly approaching, we have been overwhelmed with all the chaos a wedding ceremony can bring! Fabrics, colors, themes, and decor can cause a bride to go crazy, so Rentquest has channeled their inner interior design planning powers to design a few unique lounge set-ups and seating arrangements to help give any future brides a head start when it comes to choosing their wedding decor! OUR FIRST STOP: The closest floral shop. Choosing a color scheme for your wedding is a great start when it comes to visualizing how your special day will look. New York City's Flower District was the perfect place for the RQ team to get inspired. The various florals on the sidewalks influenced us for all three of the following themed inspirations. OUR PHOTOSHOOT LOCATION: Next, we made our way over to 287 Gallery in Chelsea to set up for our photo shoot! With three different set-ups in mind, it was hard for RQ to decide which theme we liked best. An outdoor space in the back of the gallery was fenced in with dark wood and lit up with a ceiling made of Patio Strung Lightbulbs. OUR FIRST LOOK: We chose this space for our bohemian chic reception. Our Emerald City Love Seat, Victorian Button Sofa, Velvet Peacock Ottoman, Vision Dining Table and matching Ghost Stools set the tone for a calm, yet colorful atmosphere. 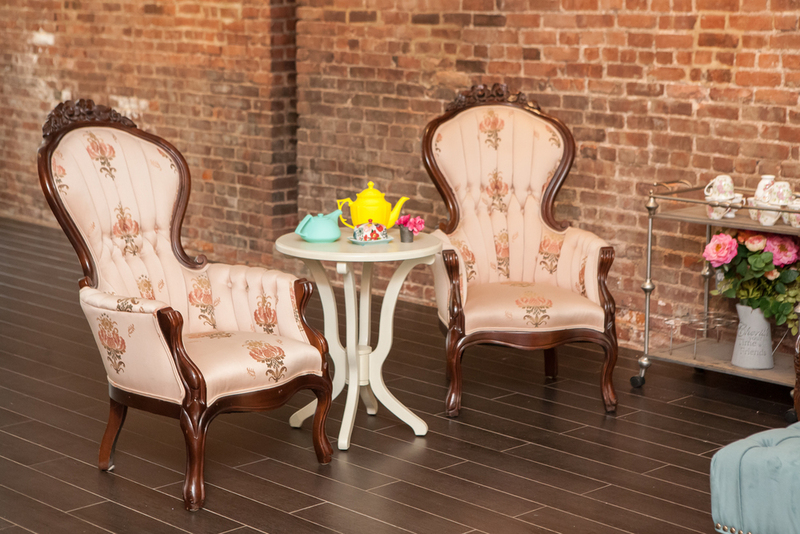 OUR SECOND LOOK: We decided to create a vintage lounge inside the gallery. With our authentic rose-colored Victorian Sofa and matching Victorian Floral Arm Chairs, we updated the look with our industrial Salinas Coffee Table complimented with white roses. OUR THIRD LOOK: The creative RQ team wanted the final set up inspired by the modern romance. A bar height seating arrangement with our Vision Runner Table, Union Square Bar Stools, red roses and leafy greens to add that amorous tone to the shoot. AND THAT'S A WRAP! Rentquest hopes our wedding lounge set-ups and seating arrangements inspires all those future brides to be and takes away some of the stress when it comes to planning the big day!